A fan favorite thanks to their prominence in the first trilogy. I loved seeing this when I opened the box from Disney because it brought back memories of the first time seeing Luke weave around obstacles on the Death Star. The official description from Star Wars reminisces on the same point! 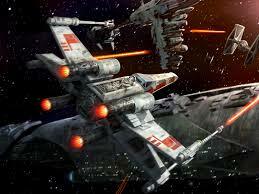 "The X-wing is a versatile Rebel Alliance starfighter that balances speed with firepower. Armed with four laser cannons and two proton torpedo launchers, the X-wing can take on anything the Empire throws at it. Nimble engines give the X-wing an edge during dogfights, and it can make long-range jumps with its hyperdrive and its astromech droid co-pilot. Luke Skywalker is famous for destroying the Death Star behind the controls of an X-wing.."